Have you ever seen a car come this close to being a literal example of the old phrase ‘cornering on its door handles’? We suspect not. 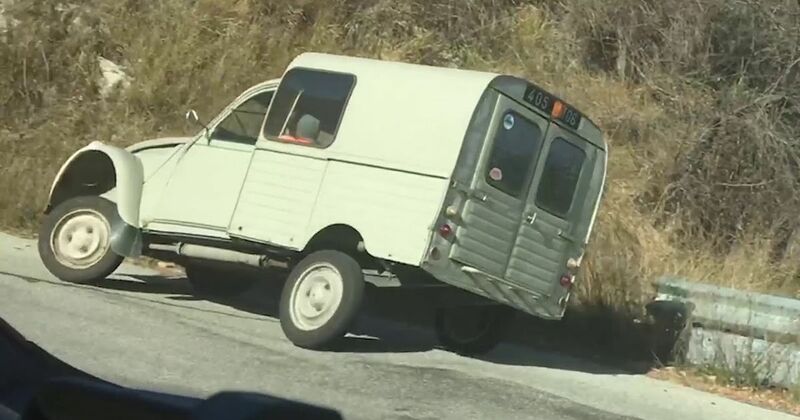 The car in question is actually more of a van - it’s the ‘Fourgonnette’ version of the Citroen 2CV. Spotted during the launch of the Up GTI in southern France by journalist Andrew Brady, the driver of this 2CV clearly did not want to be shown up by VW’s new baby hot hatch (our own, 2CV-less report from the event will be out this weekend, by the way). As a result, the unhinged pilot was cornering in a way that’s best described as ‘committed’, with the Citroen and its quirky, ultra-soft, ‘interconnected’ suspension exhibiting comedy levels of bodyroll.